This weekend was rich beyond words, but I will do my best to use them to share with you what I am learning. A few weeks ago, one of our teaching pastors spoke at one of the parishes I attend/work for. He talked about how he spends time in the word (bible) 3 times a day, 20 minutes each time. He'll read and then reflect on what he is reading. Excited about the idea and eager to go deeper, I gave it a try. Like I normally do, it was more like 2 times a day for 10 minutes and little reflection. What I was doing was still impactful but I longed for the whole package. I'd love to say, after two weeks, that I have it all together and am on my way to making the 3 times a day work. But I am still on the journey to that pattern. In fact, in those two weeks I think I spent less time reading then I did before. But the time I did read, I was truly enjoying it. This weekend, the same pastor spoke but at a different parish. This time, a few of the things he spoke about struck the same chord and this time, I felt the pull to try it again. So Saturday night, I read for about 20 minutes in Mark and 1 Peter. 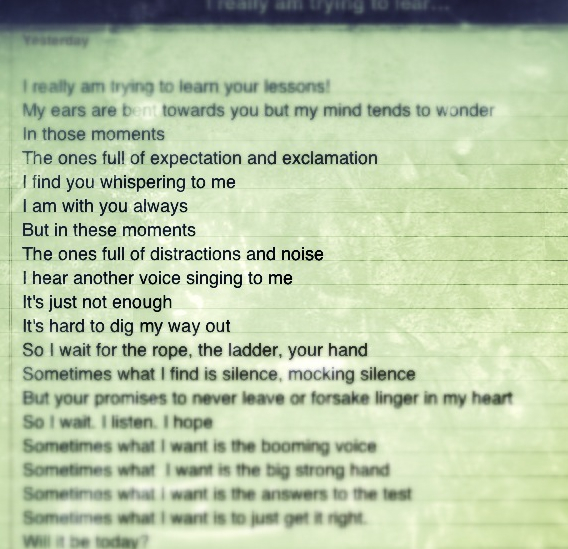 The various words I read and heard earlier that day were spinning but they were refusing to sit still. So at midnight, I started free writing, not worrying about form, or grammar or anything. 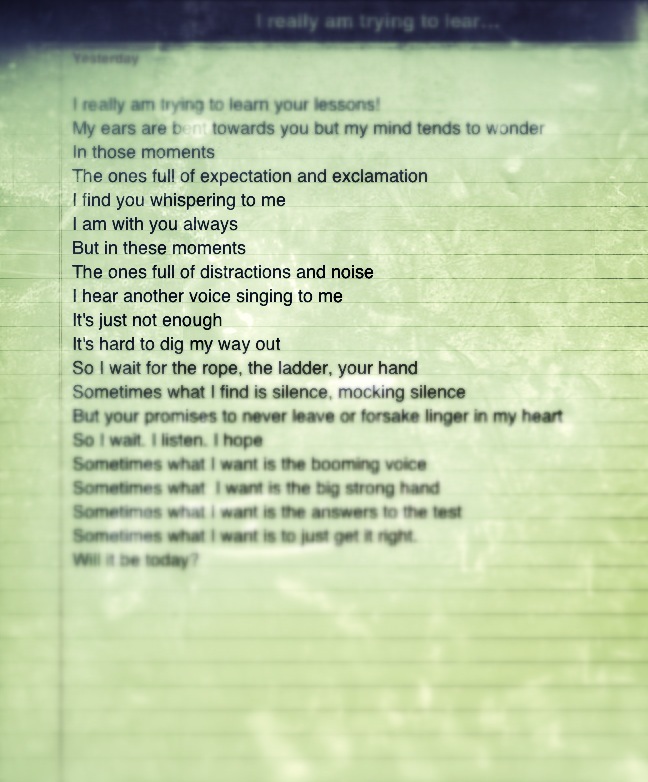 Just attempting to put down on paper the thoughts in my head. I love to write, even quit my 9 to 5 last year to pursue it more. But, for the last year I have been in such a block. What used to set me free was weighing me down instead. This week, I've had a few tastes of that freedom again and its been amazing. I don't always write for other people, sometimes I write for me. But regardless, I haven't felt free to do either in a long time. On Sunday morning, I woke up wanting to read more. That's when I came across this little gem. 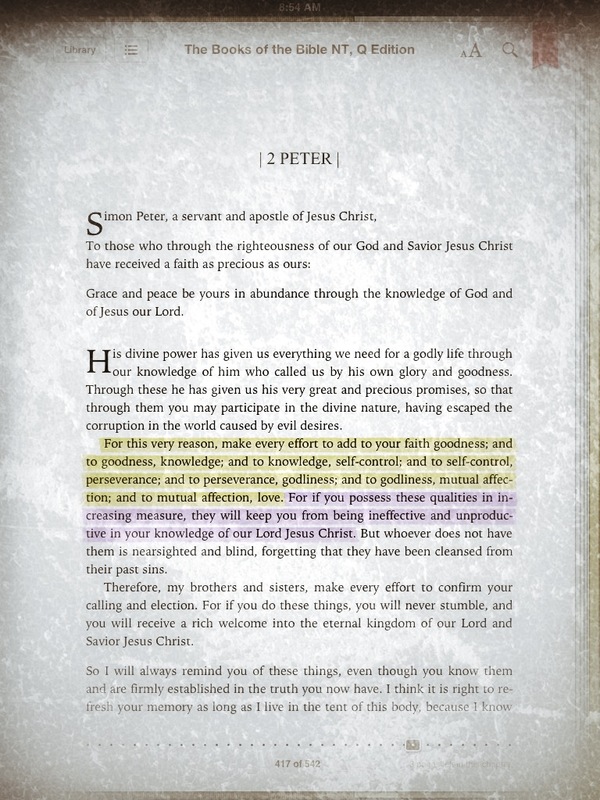 I've read 2 Peter many times especially the verse "make every effort to add to your faith goodness; and to goodness, knowledge; and to knowledge, self-control; and to self-control, perseverance; and to perseverance, godliness; and to godliness, mutual affection; and to mutual affection, love." but the following verse caught my attention this time. "For if you possess these qualities in increasing measure, they will keep you from being ineffective and unproductive in your knowledge of our Lord Jesus Christ. But whoever does not have them is nearsighted and blind, forgetting that they have been cleansed from their past sins." I have really been struggling with the idea that I am ineffective & unproductive in my knowledge of my Lord Jesus Christ. Reflecting back to the verse before, I felt like my eyes were opened to a simple truth I have forgotten. I am still processing this verse and what it means day to day. But I am so excited about where it is going to take me. Another verse that this pastor shared was from Jesus' Great Commission in Matthew. As Jesus is commissioning the 11 disciples, he ends it with "And surely I am with you always, to the very end of the age." Another verse I have heard over and over again, but something about this time was different. I was open to hearing it in a new way. As Jesus is preparing them for ministry without him physically, he is reminding them that he isn't going anywhere. He will be with them... ALWAYS. Just as he is with us... Always. We aren't alone in this journey. We try and do this all on our terms, our own strength, but He is still right there, to the very end of the age. Just a beautiful reminder of God's love and provision. On top of some other more practical things, this weekend was rich in blessings! Thanks all for your encouragement and for reading my blog! You make me smile! Great post! And so true and insprining! I love this post! What an awesome reminder that He is, RIGHT here with us. 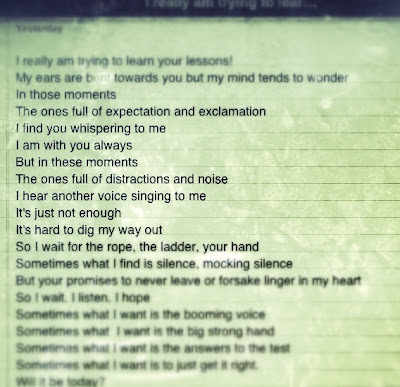 I'm right there with you with scattered thoughts. It's amazing how I can read a verse for years....hear it millions of times, and once my eyes are opened, I finally "see" what He wants me to see. That's such a great feeling! I'm glad you're weekend was so blessed and thank you for sharing. Oh girl I love this!!!! It is SOOOOOOO awesome how he IS right there with us. I forget that WAY too often! !